In Williamsburg, Brooklyn, just a block or two up from the East River on Division Avenue, Surie Eckstein is soon to be a great-grandmother. Her ten children range in age from thirteen to thirty-nine. Her in-laws, postwar immigrants from Romania, live on the first floor of their house. Her daughter Tzila Ruchel lives on the second. She and Yidel, a scribe in such demand that he makes only a few Torah scrolls a year, live on the third. Wed when Surie was sixteen, they have a happy marriage and a full life, and, at the ages of fifty-seven and sixty-two, they are looking forward to some quiet time together. Into this life of counted blessings comes a surprise. Surie is pregnant. Pregnant at fifty-seven. It is a shock. And at her age, at this stage, it is an aberration, a shift in the proper order of things, and a public display of private life. She feels exposed, ashamed. She is unable to share the news, even with her husband. And so for the first time in her life, she has a secret—a secret that slowly separates her from the community. 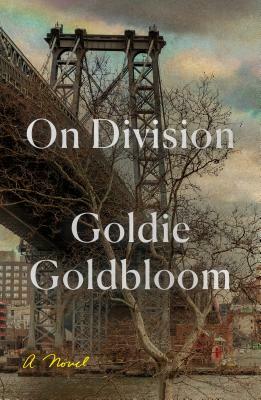 Goldie Goldbloom's On Division is an excavation of one woman's life, a story of awakening at middle age, and a thoughtful examination of the dynamics of self and collective identity. It is a steady-eyed look inside insular communities that also celebrates their comforts. It is a rare portrait of a long, happy marriage. And it is an unforgettable new novel from a writer whose imagination is matched only by the depth of her humanity. Goldie Goldbloom’s first novel, The Paperbark Shoe, won the AWP Prize, was named the Literary Novel of the Year by Foreward Magazine and is an NEA Big Reads selection. She was awarded a National Endowment for the Arts Fellowship, and has been the recipient of multiple grants and awards, including fellowships from Warren Wilson, Northwestern University, the Brown Foundation, the City of Chicago and the Elizabeth George Foundation. She is chassidic and the mother of eight children.